I absolutely LOVE Primark right now! I’ve popped in twice in February and both times have found THE BEST THINGS EVER!!!!! 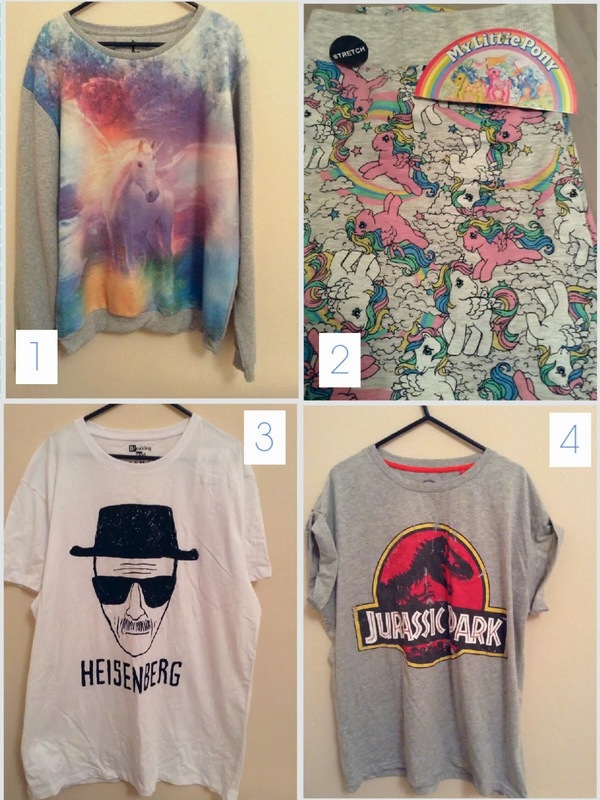 Here’s a little post to show you what I’ve bought and why I love them so much. I love a good cosy sweatshirt to wear around the house / at festivals and this one is PERFECT! I love unicorns and the colours on this print are so pretty. The front is also super soft and slightly fuzzy, so it’s even more snuggly. So in keeping with the unicorn theme, I just couldn’t resist these ADORABLE My Little Pony pj bottoms! As you may have seen back in the summer (when I bought this awesome MLP playsuit), I just can’t say no to My Little Pony ANYTHING! Primark has loads of MLP different tops and pyjama sets in at the moment, so get on down there if you’re a fan too! These pj bottoms are really comfy – slim legged legging style, so nice and warm. I am a HUGE Breaking Bad fan so when I saw this t-shirt I had to have it! I thought £8 was a really good price, and you can never have too many big baggy bed shirts! This will probably be my favourite thing I buy this year! Seriously! I had the biggest smile on my face when I saw this! As I’ve mentioned before, Jurassic Park is my all time favourite film, I used to watch it every day after school when I was little.and have ALWAYS wanted a t-shirt of the logo, but never been able to find one. Cue a VERY happy Emsy! I really like the over-sized style of this shirt, and the rolled back sleeves. My eyes were drawn to this vibrant little polish collection due to the amazingness of the green colour in particular! I’m on a constant quest to find the perfect lime green polish, so maybe this will be The One! If not, 4 polishes for £2 is still pretty good! (sorry this photo isn’t very good – I’m still struggling with blogger’s winter lack of light! All 4 colours are a bright neon shade, even if you can’t see properly here!). This was another impulse buy (classic Primark shopping!) It was in the sale reduced to £1 and I thought it looked like a fun polish to try. It is a pale grey-blue colour, with little sequins in. I think it will be great for wearing at Easter time, and mirroring the speckled appearance of those delicious Mini Eggs! I’ve seen these in Primark many times but never picked one up. However, I thought the variety of nail gems would be great for my #NailArtWeeklyProject manicure series I’ve been taking part in this month, and in fact I used the diamante style gems for my Blair Waldorf nail in my Gossip Girl inspired manicure, which you can see HERE. This is an absolute steal for £1, as you get 12 different segments filled with a variety of nail gems, including gold and silver round beads, silver stars, white pearlised tear drops, black tear drops and silver diamantes. I am IN LOVE with this bag! I actually can’t believe it is from Primark, and was only £10! I’ve been looking for a new black bag for a while and loved the winged style of this one. I also like that the zip goes all the way along the top of the bag, rather than having open topped wings like many bags of this style I’ve seen. This is crucial for handbag security on the London Tube, and also keeps the pesky rain out! I think I may do a full post on this bag so keep your eyes peeled. I’ve seen and heard sooooo many bloggers talking about these Supercosy fleece lined opaque tights. Last week I went to stay in an old manor house in the Scottish highlands for a work meeting, and knew it was likely to be pretty darn cold! I wanted to wear a smart work dress, so thought these would help keep me cosy. I wasn’t wrong! I was soooo pleased I bought these, they were super comfy and so warm! I can see why so many bloggers rave about them! 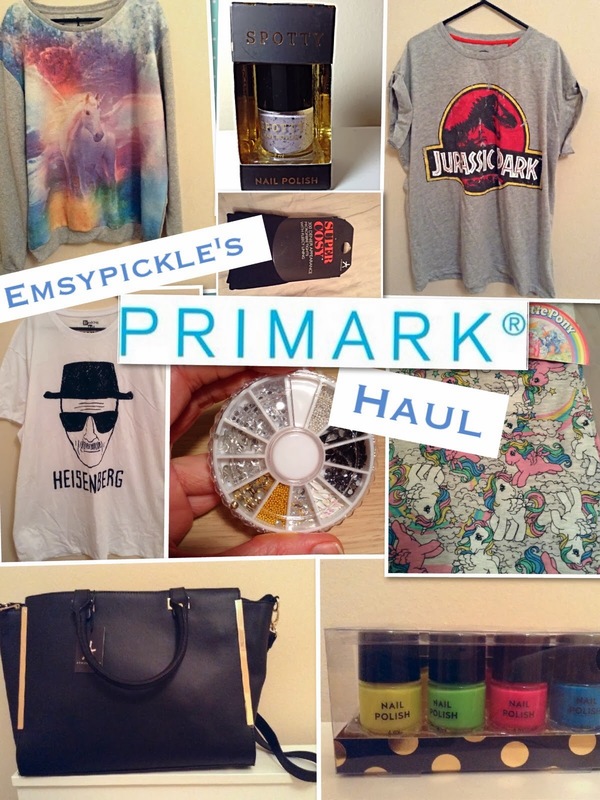 So there you go, all my recent Primark purchases. 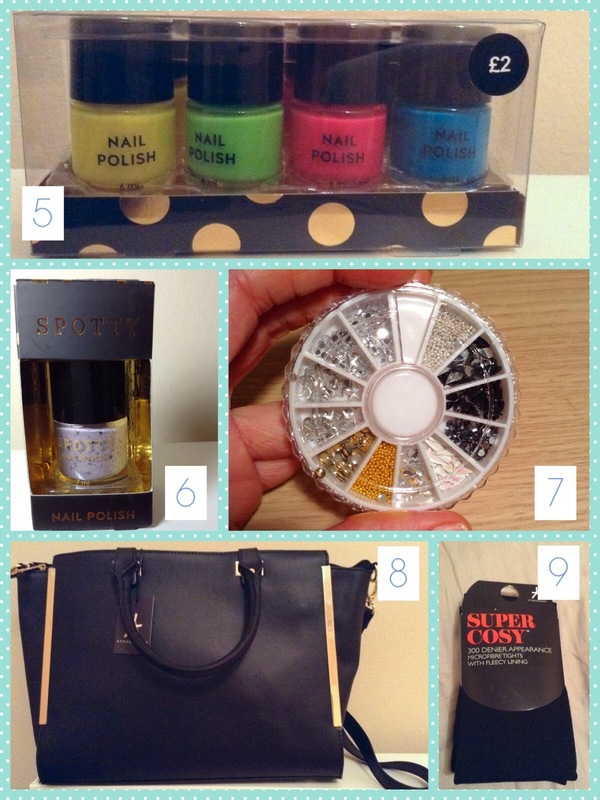 I hope you liked what I bought, and keep your eyes peeled for some in-depth reviews of the nail polishes coming soon! Have you been to Primark recently? Send me your links to any haul posts you’ve done! Next Post Blogging | I’ve bought my own domain name!